If you are a vegetarian, please don’t read this post. It involves the cooking of and devouring of amazingly delicious red meat. There is fire, smoke and meat juice involved. I doubt you’d much appreciate it. 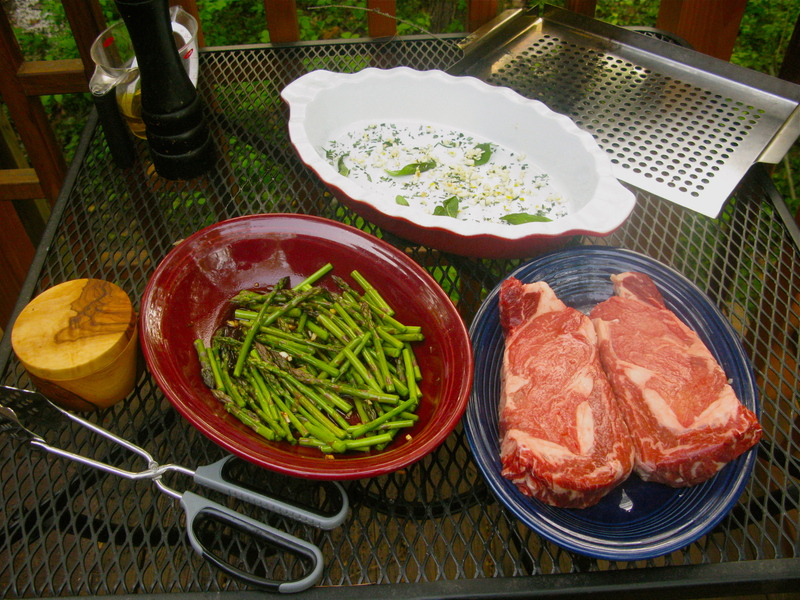 (But, for what it’s worth, I served the steak with a huge salad filled with spring veggies and grilled asparagus–look for these vegetarian recipes (and more) coming up soon! Zak (my husband, for those joining us late) SWEARS to me that he cannot cook. He is the one student I couldn’t teach–mostly because he is afraid of my super-sharp kitchen knives and I wasn’t as patient with him as I should have been. I thought it was a good idea to teach him while we cooked dinner together. However, I didn’t take into account that trying to teach someone to cook while we were both hungry is a VERY BAD IDEA. So, we gave up on lessons long ago. But, he did teach himself how to bake great bread, and he baked it for a while before finally wandering away from it. And his scrambled eggs are usually better than mine–he’s more patient and cooks them on a lower heat than I do. But even so, Zak has it in his head that he can’t really cook. BUT, he sure can throw down and grill up a dinner just as sweet as you please. I love to cook on a grill, but Zak loves it even better than I do (I think it’s because he has to tend the fire–we use wood or hardwood charcoal here, so it’s a long process–and whilst tending, he gets to drink margaritas and play guitar out on the deck), so I let him have at it. AND, not only do I “let him” cook on the grill, I downright encourage it, by giving him grilling cookbooks (Our favorites are both written by chef and expert at setting things on fire–Steve Raichlen—The Barbeque Bible and How to Grill), special utensils, and tools like grill gloves to protect him from the intense heat he prefers to cook with. So, last night, since the weather was supposed to remain sunny and warm, he decided we needed to grill out. I had a pair of amazingly marbled 1″ thick rib eyes that were just cut for me on Tuesday at Bluescreek Farm Meats in Columbus, and he wanted to do something different with them. Of his own volition, Zak went into the kitchen, plucked Raichlen’s How to Grill up off the shelf, and began to perusing. It didn’t take him long before he had his heart settled on Raichlen’s version of the classic Tuscan grilled porterhouse recipe: Bistecca alla Fiorentina. Note, it is supposed to be made from a porterhouse steak, and all we had were rib eyes, but you know–after reading the recipe together, we reckoned it couldn’t taste bad with a rib eye, and if we liked it (which we knew we would, mind you), we could, at a later date, purchase a porterhouse and make it again. Because, you know, eating good beef grilled on a wood fire then rubbed with herbs and garlic and doused in fragrant extra virgin olive oil would be a horrible hardship that we knew we would have to struggle to survive. But we were willing to do it all, in the name of culinary exploration. Now, before I give the recipes, I have to fess up to doing all of the prep work for Zak. He still is wary around my knives, so it’s just easier if I cut for him. And mincing–oy. That’s just too close to the knife blade for his comfort, so I took on the job of mincing the garlic and fresh rosemary leaves (out of our garden!). But that doesn’t matter–Zak did the hot part of the cooking–and it turned out divine. Our assumptions were correct–a rib eye cooked on a wood fire and doused with super-delicious olive oil is never going to bad. I mean, so long as you don’t set the piece of cow on fire and turn it into a little charcoal briquet/cremated cow corpse bit, it simply cannot taste bad. Or, unless you are a vegetarian or you don’t eat beef or don’t like it or something. Then it would be bad, but only subjectively. Objectively speaking, it was bound to be delicious. And it was. Now, I have to admit that Bistecca alla Fiorentina is pretty much over-the-top rich. It’s made with a rich cut of beef, which is minimally seasoned with salt and pepper before being grilled over a hot hardwood fire. Then, after it is cooked, you lay it into a casserole dish into which you have scattered minced garlic, minced fresh rosemary and six lightly bruised fresh sage leaves. While the searingly hot meat is making the acquaintance of the sundry gathered aromatics, you then pour half a cup of the best, most fragrant olive oil you possess over the meat and then turn it over and let it rest for a few minutes. Magic happens in those few minutes. 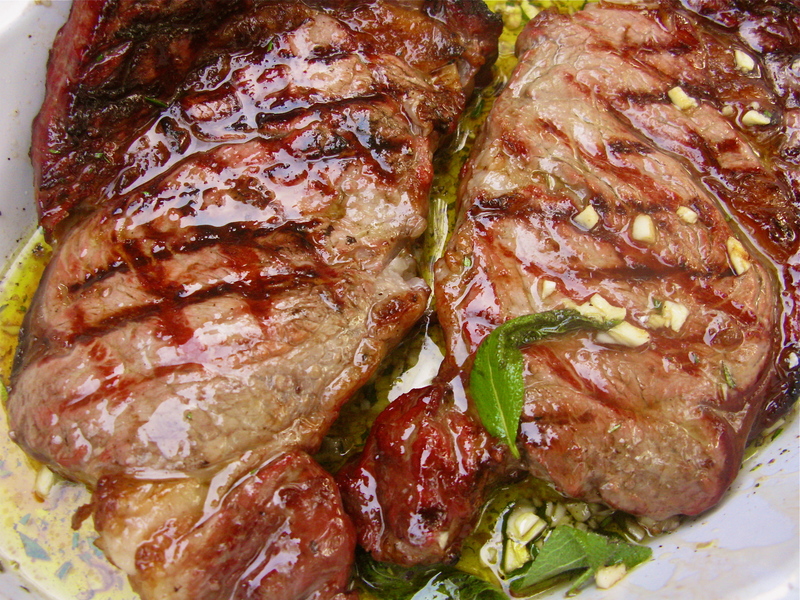 The meat juices seep into the olive oil marinade and the heat of the steak helps release the fragrances and flavors of the aromatics, which seep into the oil and onto the surface of the meat. It’s just heavenly. There used to be a farmer near Logan, Ohio who raised Chianina,but I don’t know if they still are. If not, David and Cheryl of Bluescreek Farm raise Belgian Blue cattle, which while they are not as gigantic as the Tuscan Chianinas, they are also produce flavorful, superb, lean cuts of delicious beef. I don’t have any trouble at all substituting Bluescreek’s beef for the traditional breed used in Tuscany. But yeah, Chianina or not, porterhouse or rib-eye, this is one rich dish. I suggest serving it rarely, as a treat, and then, serving it with lots of vegetables. I made a roasted beet, mixed lettuce, spinach, carrot and radish salad dressed with a very light basil, honey and lemon vinaigrette as well as a big old pile of grilled asparagus. (Which Zak also cooked. He’s getting good, I tell you!) We didn’t bother with anything starchy. We just ate lots of meat and vegetables. Maybe the amount of vegetables we ate offset the amazing meat in our diet karma or something. Probably not, but I had to try! So, finally, here’s the recipe, adapted from Raichlin’s, though I will say that the only true adaptation was that we switched out porterhouse for rib eyes and used hickory wood to cook them instead of oak, simply because that’s what we had. Other than that, the techniques and all are Raichlen’s. (And may I say, if you want one or two grilling handbooks, either or both of the titles I mentioned above are perfect. So, without further ado, here’s Chez Zak and Barb’s version of bistecca. Set up your charcoal grill for direct grilling using hardwood chunks. We used hickory, because that is what we had. If you do not know how to do this and want to learn, look at Raichlen’s quick and dirty explanation of how it works here. His books have lots more information and hold your hand step by step, but those few paragraphs hold the gist of how its done. If you want to just use your charcoal grill the way you always do, go for it. If you must, use a gas grill, but in either of these cases, use some soaked hardwood chips to make smoke–the smoky flavor is part of what makes this recipe so special. 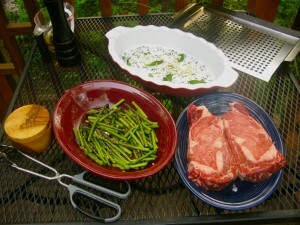 Plop the steaks down on the hot grate at a 45 degree angle to the bars on the grate. Grill until cooked to taste. (For rare, that is about seven to ten minutes per side–or to about 125 degrees F on your meat thermometer. Rotate the steaks about 3 minutes into the cooking process to make pretty grill marks in a diagonal crosshatch pattern. While the steak is minding itself for a few minutes on the grill, sprinkle the garlic, rosemary and sage leaves all over the bottom of a shallow gratin or baking dish that is big enough to hold the meat. When the steaks are done, pluck it from the flames, and lay those beauties right down on top of the aromatics. Turn them over a couple of times to get both sides good and coated with the wee fragrant bits. 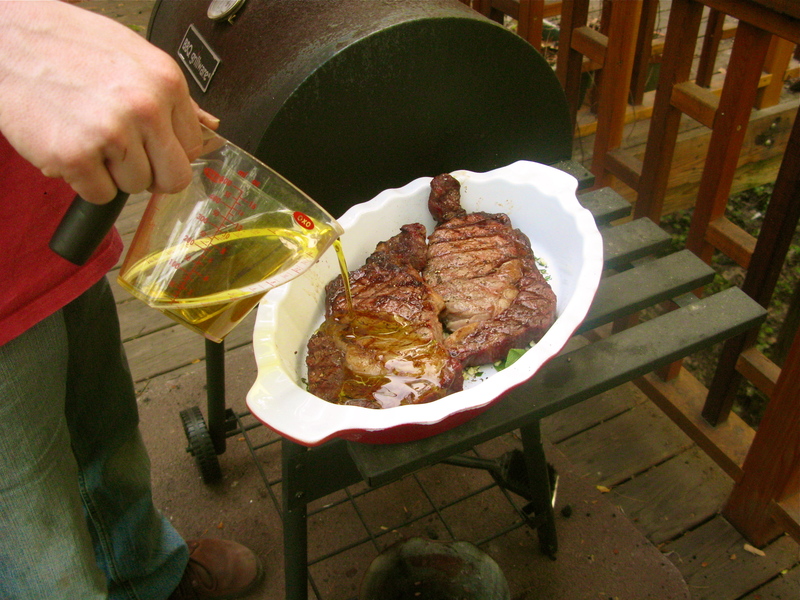 Then, pour the oil slowly over the meat. Turn the meat again a couple of times, letting it marinate for 3 to 5 minutes or so while it’s resting. When you are ready to serve the steaks, remove them and place them on serving plates, then using a spoon, drizzle some of the meaty-juicy-delicious oil over the tops of each one. Barbara, I swear I can hear my boyfriend begging me to cook this all the way from Afghanistan. 🙂 Would this recipe work with a leaner but tender cut of beef, like a filet mignon? Yes, Laura, it would. Don’t grill for as long. That’s it. Grill it as you would grill your usual filet mignon. Truthfully, I suspect the olive oil is used traditionally because the Chianina are not very fatty cattle. They have very lean meat, so the huge amount of olive oil is probably to make up for that. But on the other hand–it could be that the olive oil just tastes fantastic, and they’d have done it no matter what kind of cow they were cooking. I spent the weekend reading Raichlen’s “Plant Barbeque!” whilst dreaming of the lovely 2 week camping trip I’ll be taking in July.You made me decide to take the plunge and get his “Barbeque Bible” as well:). You might be happy to know that I’ll also be taking some of your version of char siu camping with me. Makes wonderful sliders, stir fry and additions to Mandarin wonton soup with of course your chicky pork stock as the base. Thanks much for being U! You are a great ambassador for our industry. Your knowledge, passion and use of the most delicious avaialable is appreciated. It is exciting to see experts, such as yourself, utilizing beef to its fullest extent. We also love the agricultural persona stressed with your blog!